Just bought an Italian greyhound? Just found out your dog actually needs clothing! Our guide to Italian greyhound clothing explains exactly why this breed of dog needs clothes and provides you with useful facts & information you want to know. Beware of the Italian greyhound. This warning is not for the trespasser; rather for the one seeking to buy one for them self. This little dog can hardly scare off a sparrow but there are a few things a prospective buyer should know from beforehand. Not only will you be paying the price for the dog and his daily food you will also have to get your Italian greyhound a wardrobe that suits his requirements. The Italian greyhound has a very delicate demeanor and a fragile body which is susceptible to the effects of weather. No Italian greyhound likes going out in the cold and you can see them lift up their noses at the slightest sign of a cool breeze indicating their discomfort. 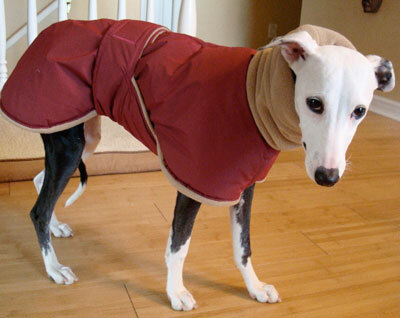 An Italian greyhound will require a full fledged collection of winter apparel because this is the season which poses a threat to the dog’s health. This particular breed of dog has very little body fat on top of which it is extremely fine skinned so it does not have the adequate natural resources to guard itself in such weather. You will definitely need a rain coat for the little pup because you never know when you can encounter a downpour. In fact you will notice the Italian greyhound showing signs of discomfort even in a slight drizzle. You will find that pet stores have come up with entire clothing lines that serve the various functions for which protection is required. Although you may think the idea of dressing up the little dog is fun but when you have to spend your dollars on the different kinds of apparel that you will need for the Italian greyhound you may develop another perception. Your dog will need a pair of jammies for the indoors in order to keep him cozy on those snowy nights. Some dogs are not very fond of wearing clothes when they are on the inside so you might even have the chance to drop this one out of your list. But body suits, sweaters and coats are essential if you are going to be taking your dog out in the winter. The Italian greyhound will not enjoy walking in the snow that’s for sure and you will probably have to carry it around with you. Nonetheless you will be required to provide adequate winter gear for the dog lest it falls sick due to the cold. Keep in mind all dog clothing will not fit the Italian greyhound nor will it give him the desired protection. This is because the Italian greyhound is an extremely thin dog with a deep chest coupled with long legs and high tucks. You will have to go for that clothing which has been designed specifically for this breed of dogs. To cash in on the situation designer labels have started producing designer dog wear. This is because the Italian greyhound is a popular celebrity choice. So it’s become sort of a fashion statement for them to make their dogs wear the same brand as themselves. It’s a mad world after all but at the other end of it the dog gets to keep warm in the best of tailor made winter clothing for it’s kind.